Rigid Kitchens or Flat-pack kitchen Furniture? When looking to purchase a new kitchen the easiest, quickest and cheapest option might seem a flat-pack kitchen for home assembly. But if this is such a good choice, then why do so many people opt for rigid kitchens, pre-made in factories, rather than flat-pack kitchens? The arguable benefits of flat-pack furniture is that it is space-efficient, easy to transport and usually available for immediate collection. The combination of these factors reduce (or indeed remove) any shipping and storage costs, and result in a cheaper price for the consumer. Flat-pack kitchen self-assembly is not always as straightforward as hoped! People all too often find that assembly instructions are poorly worded or contain vague illustrations. This proves extremely frustrating but can also result in incorrect assembly (sometimes irreversibly) and the process becomes extremely time-consuming, which defeats the intention of it! What is supposed to be a benefit of flat-pack kitchen furniture can quickly become the converse of this, with any price-saving benefit lost in the cost of assembly time. A further downside of flat-pack kitchen furniture is it is mass-produced so there is no room for customisation or individuality. But these inconveniences aside, the main reason people choose rigid kitchens over flat-pack furniture is the product itself, and the manner in which it is constructed. The difference in manufacturing processes means rigid kitchens will always be better quality than flat-pack kitchen furniture ensuring they are more robust, longer-lasting as well as more visually impressive. …..What’s different between Rigid Kitchens & Flat-Pack Kitchen manufacture? LWK Kitchens’ German kitchen manufacturing site, a specialised and expansive factory. Within both flat-pack and rigid kitchens manufacture, the timber selected for the kitchen furniture can be of the highest quality but whether the end-product is of the same calibre is dependent on manufacture process. At LWK Kitchens, all kitchen furniture is built to individual order specification and produced by specialist manufacturing machines in Germany that have been honed to perfection, leaving next to no room for error. All furniture components are carefully crafted and the finishing process is monitored for quality at every step of the way. ….Why does the kitchen manufacture process matter? The rigid kitchens cabinets will be square along every side and every elevation, which is not easy to do by hand in an enclosed space. If the cabinet is not square then your doors will never align perfectly. Specialist kitchen manufacturing ensures doors, drawers and runners are perfectly aligned. Drawer runners are also fitted by machine within rigid kitchens so they are mm perfect. Whereas, if your kitchen has 10 drawers then this would mean 20 runners that your installer would have to fit in perfect symmetry on either side of the carcass- no easy task! Flat-pack kitchen units use screws for the joints, meaning they will always be visible when you open your cabinet doors. The type of joint used within kitchen cabinetry manufacture is one of the key factors that determines the quality of construction, and in turn the quality of the end-product. Unlike flat-pack construction, most rigidly manufactured kitchen furniture is constructed using Glue and Dowel Joints. Rigid Kitchens: What is a Glued and Dowelled joint and what are its benefits? A dowel joint is comprised of two pieces of wood that have been joined and effectively held in place by small cylindrical wooden rods that are called dowels. Holes are bored into the pieces of wood to be joined, and the size of the holes match the size of the dowels so they can be neatly inserted. Following this the dowel joint is glued so that the two pieces of wood are fixed together through the formation of a firm and stable joint. The dowels used for joints can be of all different sizes, and the use of dowel is not limited to wood constructions but metal too. The benefit of using this type of join being that it forms a very strong and durable bond. 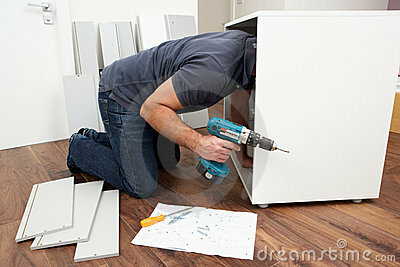 Conversely, flat-pack furniture tends to feature Knock Down Joints. These are joints typically made of plastic and include a bracket for fixing the two pieces of wood together. The bracket is fixed with a screwdriver or hammer and its presence simplifies the process so it can be achieved without the need for strong carpentry skills. A form of Knock Down joint, and one consumers should be wary to distinguish from the Glued & Dowelled joint is ‘Cam and Dowelled’ cabinetry. A Cam is a small circular component, usually metal, which is embedded into a compatible hole in the wood. The two separate pieces of wood are then joined with a connector. The connector is slid into the cam from a perpendicular hole, and lined up so that the protruding end of the connector can be inserted into another aligned hole (pre-formed) in the second piece of wood. The two pieces of wood should now be lined up and once in place a screwdriver is inserted into the cam, turning it 210 degrees and in so doing this action turns and locks the pieces of wood in place. Why does the type of join matter to my kitchen cabinetry? The Cam and Dowel is an adequate join but is not permanent and runs the risk of coming loose. If you imagine a drawer that is repeatedly opened and shut, opened and shut, this movement may in time work the fittings loose and in so-doing jeopardise the stability of the cabinetry, and all held within…would you really want this for a drawer or cabinet containing your glassware? It is important to recognise and establish a difference between the type of joint used when purchasing your kitchen, particularly as the difference between a rigid glued and dowelled cabinet and a cam and dowelled cabinet should be reflected in the price! In summary, flat-pack kitchen furniture might be cheaper and more immediately available but in the long term it is much less likely to make for a sound investment. Whilst it has a longer lead time, Rigid kitchen furniture will always be worth the extra wait as it looks better, feels better and has a much better and more durable quality of construction. Most rigid kitchen suppliers will also deliver straight to site, which removes any worries of how the furniture will fit in the car! For anybody looking to purchase a new kitchen we would recommend Rigid kitchens over flat-pack kitchen furniture, every time.